What is the Age of Aquarius about? Well! It's 2000 years that bring us the best of Aquarius, Uranus, and Saturn... as long as we do our parts to help it along. That's what the Age of Aquarius is all about! The Sun is seen to move very slowly through all the signs of the Zodiac. (It takes about 2,000 years to go from one to another.) Whatever Zodiac sign the Sun is in at any time, is the name of the World Age we are currently in. When we see the Sun in the area of space that we call Aquarius, we say that we are in the Age of Aquarius. Why are the Astrological Ages important? Because it colours everything that happens in the solar system. It's as if Aquarius were a filter in front of the Sun, lending its unique colour to the sunlight we receive. Just as your birth sign tells you a lot about your character, and your moon sign tells you a lot about your dreams, the sign of the Astrological Ages determines the quality of these 2 millennia for the whole planet. For example, during the past 2000 years or so, we have been in the Age of Pisces. Now we are leaving the Age of Pisces and entering into the Aquarian age. Although there is certainly no agreement on specific dates, most estimates agree that we entered the Age of Aquarius in the end of the 20th century. The uncertainty over exact dates is due to the very simple fact that the sky isn't divided up by boundary lines. Who can say exactly when we've crossed from one sign to another? So the Aquarian Age is not exactly tied to the year 2012. But it is certainly part of the 2012 Transition. There is also the fact that any transition is a process. The effects of any astrological event extend before and after its actual occurrence. But what's really important about the Age of Aquarius is not these mundane details. What matters is what the Age of Aquarius portends for the Earth. 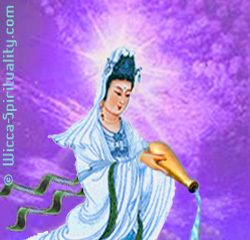 During the Age of Aquarius, the dominant paradigm is that of the Water Bearer. As the sign of Aquarius is ruled by both Uranus and (to a lesser degree) Saturn, so Aquarian, Uranian, and Saturnian qualities will determine the direction that the Earth will take, over the next 2 millennia. Aquarius is all about making the world a better place. Having a strong social conscience, combined with a innovative, visionary intelligence, Aquarius can really make it happen, too! Aquarius is compassionate and caring, but also eccentric and unbound by convention. She values progress and technologies that can revolutionize the world. Saturn was the ancient ruler of Aquarius. Uranus is the modern and future ruler. They are still engaged in some battle over turf. Saturn, even in its good qualities, is somewhat grim. Saturn is sensible, stern, strict, grave, formal, and forbidding. Saturn is all about rules, authority, propriety. Saturn values discipline (self- and other), caution, and prudence. Uranus symbolises a rebellious spirit, individualistic, unwilling to accept rules and limitations. Uranus energy is passionate, spontaneous, tempestuous, brilliant, innovative, and revolutionary. Uranus is not interested in outside authority, propriety, or imposed customs. Uranus is like the rebellious teenager, not willing to blindly accept his parents' rules or beliefs, determined to find his own truth, to make his own way. While it seems at first glance that Saturn and Uranus are completely opposing forces (and in many ways they are), it is also worth noting that without some of the stabilizing self-control and respect from Saturn, Uranus can't achieve the best of his potential. International collaboration, a sense of solidarity and unity that crosses all boundaries. In fact, it's likely that the boundaries themselves may vanish, seen at last for the imaginary divisions that they really are. We can create real governmental representation, a true democracy that really cares for the needs of the people. And not just for the short term, but in consideration of all those who will follow after us. As the very belief in divisions and separations falls away, we regain our membership in the fellowship of this planet. We see ourselves once again as siblings to all creatures, and servants of the well-being of the Earth. We will naturally extend kindness, compassion, and care to all beings, as we can perceive ourselves to all be one consciousness. We will leave behind "the superstition of materialism" (as Deepak Chopra so aptly calls it), understanding at last that we have no need for material possessions and money when we can manifest what we need, and when all humans take care of one another. Religions will lose their hierarchical, authoritarian structure. Spirituality becomes the primary focus -- the individual connection with the Divine Source. Rules, morals, and blind obedience will fall away, replaced by personal responsibility, spiritual wisdom, and ethics. Individuals and societies achieve higher consciousness and enlightenment. Humanitarianism and human rights become the foundation of social policy. We cherish and celebrate uniqueness, not expecting other people to conform to some arbitrary standard out of our fear of differences. We will treasure the diversity that the Source creates. There is likely to be much more computerization. We may begin to travel to other planets and stars. And/or visitors from other stars may make themselves known. If you're like me, you've probably wished a thousand times for a world like this! And you are here now -- it is no coincidence! -- to not only see it come true, but to help make it happen! Some have said the Aquarian age has the potential to be horrific. Any sign, any quality, has its good potential and its bad potential. This is especially the case when Saturn is also involved. Saturn (on the shadow side) represents control, limits and boundaries, power over others, tradition, conservative resistance to change, death, etc. The shadow side of Uranus is contemptuous, dictatorial, destructive, unstable, scheming, and explosive. Aquarius also has its shadow side: unpredictable, impatient, impersonal, cold, and even self-righteous. However, there are other forces at work to support the positive side of this transformation. And remember, too, that we aren't helpless victims of this new World Age. We get to make it either positive or negative! By our thoughts, our actions, and our emotions, we get to choose what future we create. Which future are you choosing?